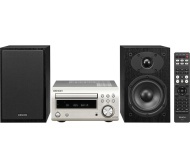 alaTest has collected and analyzed 13 reviews of DENON DM-41DAB Wireless Traditional Hi-Fi System - Premium Silver. The average rating for this product is 4.9/5, compared to an average rating of 4.1/5 for other Audio Systems for all reviews. We analyzed user and expert ratings, product age and more factors. Compared to other Audio Systems the DENON DM-41DAB Wireless Traditional Hi-Fi System - Premium Silver is awarded an overall alaScore™ of 89/100 = Very good quality. It looks good, the sound is great and the price we paid was even better ! This unit is very compact, it is easy to use, just connect it all up plug it in and start enjoying. The sound it produces is superb. Speaker wires should have been better at the price of the package. We're really pleased with this product. Everything about it is good. Can't think of anything bad! Fanastic rich sound - big sound from a small system. No need to costantly update software - it's been thoroughly designed to use from the box! The ventilation holes whilst needed to keep the system cool, are a little unsightly when viewed from the top and side - a very small price to pay for a 5 star system at this price!! Was concerned that the price point was high compared to products that look like they have the same capability, however having listened to those 'side by side' against the Denon its easy to justify the additional spend.